As a seller, you will be most concerned about ‘short term price’ – where home values are headed over the next six months. As either a first time or repeat buyer, you must not be concerned only about price but also about the ‘long term cost’ of the home. What will happen in 2015? A nationwide panel of over one hundred economists, real estate experts and investment & market strategists project that home values will appreciate by 4.3% by the end of 2015. Additionally, Freddie Mac’s most recent Economic Commentary & Projections Table predicts that the 30-year fixed mortgage rate will be 4.3% by the end of 2015. 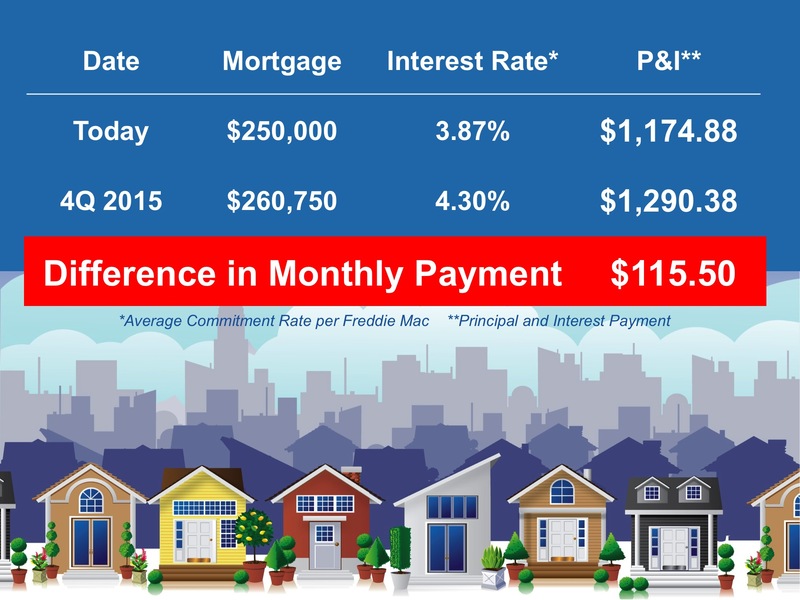 The additional $115.50 per month might not seem like much, but over the course or a year ($1,386.00), or the life of the mortgage you could be paying over $41,500 just by waiting until the end of this year to buy.